How much does it cost to travel to the Czech Republic? How much money will you need in the Czech Republic? Kč1,938 ($85) is the average daily price for traveling in the Czech Republic. The average price of food for one day is Kč471 ($21). The average price of a hotel for a couple is Kč2,235 ($98). Additional pricing is in the table below. These average travel prices have been collected from other travelers to help you plan your own travel budget. How expensive is the Czech Republic? How much money do I need for the Czech Republic? The Czech Republic, although not large, is rich in history and culture. It is a landlocked country in Central Europe with a lot to offer visitors. The architecture is beautiful, the food filling, and the beer delicious. The Czech Republic has securely found its way onto the tourist circuit, and with good reason. Hiking, swimming, and pub crawling opportunities abound. Prague is easily the most popular city to visit in the country, but those who linger longer and explore more in depth will be well rewarded. The country is divided into 14 different political regions which can be grouped into eight historical regions. These include Central Bohemia, which includes the city of Prague. There is also West, North, East and South Bohemia as well as the Bohemian-Moravian Highlands, North Moravia and South Moravia. Cycling is a popular activity in South Bohemia and the Moravia regions offer impressive vineyards, orchards, and agriculture. There are also many quaint villages and beautiful mountains. 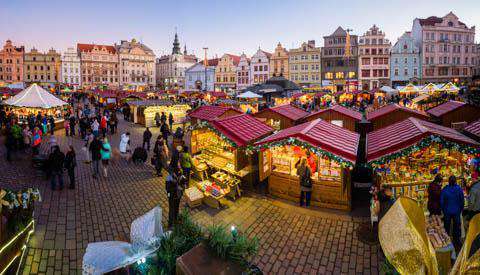 Although many visitors limit their stay to the famous and beautiful city of Prague, if you have time, make sure you explore other areas throughout the country. There are many different interesting cities and the countryside can be fun to explore. There are also many hiking trails worth experiencing. You can purchase a good trail map in most outdoor oriented stores. Beer drinking is a national past time in the Czech Republic. It's truly a cultural experience and you must not miss the opportunity to go to a Czech pub for dinner and beer. The most well know exported brands include Pilsner Urquell, Budweiser Budvar and Staropramen. Popular domestically available brands include Gambrinus, Kozel, Bernard, Radegast, and Starobrno. Do remember that real Czech beer is only served on tap. Holidays are also an important part of the Czech culture. Some of the most celebrated holidays include Easter, Feast of St. Mikulas, celebrated on December 5th, and Christmas. Bus travel is an affordable and convenient way to explore the country. Many buses leave from Prague and travel to the major cities throughout the country. In general, buses are slightly faster and less expensive than trains. This is particularly true on the routes where there are no direct trains. Reservations are often not required for bus travel, but if you're looking to travel on weekends or holidays, it is probably best to buy tickets in advance. If you're planning to drive a vehicle you will need to purchase a toll sticker. These stickers can be purchased for different lengths of time and for different sized vehicles. The cost will vary depending on the type of sticker you buy. Those drivers who do not have a toll sticker will be fined heavily. The state owned company of Ceske Drahy operates the majority of the trains in the country. There are also two private companies, Regiojet and Leo Express. Trains are very thorough throughout the country and stop in even the most remote areas. Some service can be slow, but the time schedules are reliable. The most common language is Czech, but the Slovak language is not uncommon either. Once you leave the major tourist areas you likely won't find many signs in English. The older population is less likely to speak English as well so it's best to learn a few words in Czech before you begin your trip. If you find yourself in a bind, the younger population will likely speak at least a little English. Many people visit only Prague during their time in the Czech Republic. This is unfortunate, as the country has so many different places to explore. Consider allowing yourself more time so that you can explore the smaller towns and countryside in depth. The Charles Bridge: In Prague, the Charles Bridge is a famous landmark that connects the city's Old Town with Lesser Town. Its initial construction dates back to the 14th century. It's a beautiful landmark and is a busy place for musicians, artists and merchants during the day. The Prague Castle: This castle overlooks the city of Prague. It includes the St. Vitus Cathedral and lookout tower, the Castle Picture Gallery, some palaces and museums as well as the Royal Gardens. It is a site that is not to be missed in the city. Cesky Krumlov: A UNESCO World Heritage Site, this is one of the most famous medieval town in Eastern Europe. It is located in the south Bohemian Region of the country and is well know for its architecture and old town. Traditional Czech cuisine is quite hearty and filling in nature. It can be very fatty and saucy, but in recent years, efforts have been made to make the dishes lighter and include more vegetables. Czech dumplings are quite dense and many of the meat dishes are prepared with a hearty sauce. Beer is a favorite drink throughout the country as well. Bramboracka: Czech cuisine offers a variety of popular soups. This potato soup is one of the most common and can be served either with or without wild mushrooms. Knedliky: Czech dumplings are a popular side dish throughout the country. They are often made from boiled bread and served along with pork or another meat, although some dumplings are stuffed with a filling and served a main dish. Pecena Kachna: This typical Czech dish is made from roasted duck and is served with bread or dumplings as well as red and white sauerkraut.